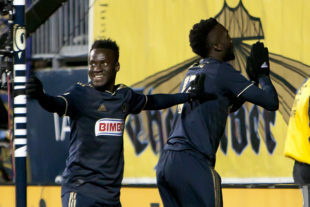 Philadelphia Union are in the midst of a busy stretch of games leading up to the World Cup break. The Union are unbeaten over their last three matches, picking up seven of nine available points. For head coach Jim Curtin, the question is how to maintain their run of good form. For the coach, that means sticking with the midfield trio of Alejandro Bedoya, Haris Medunjanin, and Borek Dockal. Curtin said he wants to continue developing the “chemistry” those three are building. There is a practicality in focusing the attention on the Fire. Tomorrow’s visitors currently sit one point behind the Union as both teams fight to climb into that final playoff position. It’s also the most winnable of Philadelphia’s upcoming MLS action. They’ll enter the World Cup break after hosting Toronto FC. While the Reds may be struggling this season, they are still coming off the best season in MLS history. Sandwiched between the home games against Chicago and Toronto is a trip to Atlanta. “It’s no secret that going to Atlanta is becoming one of the most challenging things to do in our league,” said Curtin. The Union could be better served being pragmatic, chasing three points against the Fire and rotating the squad on the road against the Supporters’ Shield leaders. Curtin, though, did hint there, “maybe they’ll be a change or two” tomorrow night. One candidate to return the starting 11 could be winger David Accam. The Ghanaian international, who was acquired from Chicago for $1.2 million, has lost his place in the lineup after a disappointing start to the season. Curtin said Accam will play a role against his former team, but did not give away what that role may be. After scoring 33 goals in three years with the Fire, maybe it will provide the spark for his first goal with the Union. Yaro still hasn’t cleared concussion protocol. Curtin said the Union have added a younger player from the Steel roster for the game, but didn’t drop a name. Starting Accam makes sense to me. I’d prefer him starting up top but you know Curtin won’t break from his preferred striker body type (whether it’s CJ or Corey). Jim sure didn’t waste any time thinking about Earnie’s departure, eh? Maybe the next guy won’t be so satisfied with Curtin’s lack of innovation. My money is on Chris Albright being the next guy, frankly.